RANCHO PALOS VERDES — An investigation was under way on Wednesday into a home invasion robbery in Rancho Palos Verdes, where a man, his wife and daughter were held in house for nearly three hours while two men ransacked the home before escaping with cash, authorities said. 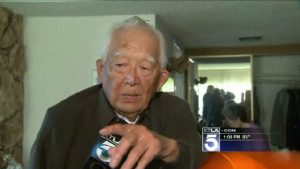 According to KTLA News, Nob Kubota, 89, reported around 10:45 p.m. Tuesday that he and his wife and daughter had been held inside the house on Miraleste Drive since about 8 p.m.
Kubota said there was a knock at the door, but when he looked through the peephole, he didn't see anyone. Thinking that perhaps a package had been dropped off, he opened the door, and the suspects forced their way inside. They made the family lie on the bed in the master bedroom while they ransacked the house for several hours. “They kept saying, 'Where's your money? We're going to take your wife if you don't tell us where it's at,'” Kubota recalled. Kubota said the robbers took about $3,000-$4,000 in cash, as well as valuable jewelry, including wedding rings. They also took a rare coin collection worth over $100,000. He said he was not seriously hurt, but he was roughed up a little. He said his ear was ringing from being hit in the head. Lt. Greg Ahn of the Los Angeles County sheriff's Lomita Station said it was unclear if the suspects were armed. The robbery took place in an upscale neighborhood where such crimes are unusual. Anyone with information is asked to call the L.A. County Sheriff's Department.